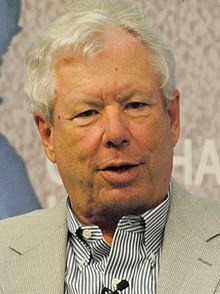 Richard H. Thaler (/ˈθeɪlər/; born September 12, 1945) is an American economist and the Charles R. Walgreen Distinguished Service Professor of Behavioral Science and Economics at the University of Chicago Booth School of Business. In 2015, Thaler was president of the American Economic Association. He is a theorist in behavioral economics, and collaborated with Daniel Kahneman, Amos Tversky and others in further defining that field. In 2018, he was elected a member in the National Academy of Sciences. In 2017, he was awarded the Nobel Memorial Prize in Economic Sciences for his contributions to behavioral economics. In its Nobel prize announcement, the Royal Swedish Academy of Sciences said that his "contributions have built a bridge between the economic and psychological analyses of individual Decision-making. His empirical findings and theoretical insights have been instrumental in creating the new and rapidly expanding field of behavioral economics." Thaler was born in East Orange, New Jersey to a Jewish family. His mother, Roslyn (Melnikoff, 1921–2008), was a teacher, and later a real estate agent while his father, Alan Maurice Thaler (1917–2004), was an actuary at the Prudential Financial in Newark, New Jersey, and was born in Toronto. He grew up with two younger brothers. His great-great grandfather, Selig Thaler (1831–1903) was from Berezhany, Ukraine. He is married to France Leclerc, a former marketing professor at the University of Chicago and avid photographer. He has three children from his first marriage. He graduated from Newark Academy, before going on to receive his B.A. degree in 1967 from Case Western Reserve University, and his M.A. in 1970 and Ph.D. degree in 1974 from the University of Rochester, writing his thesis on "The Value of Saving A Life: A Market Estimate" under the supervision of Sherwin Rosen. After completing his studies, Thaler began his career as a professor at the University of Rochester. Between 1977 and 1978, Thaler spent a year at Stanford University collaborating and researching with Daniel Kahneman and Amos Tversky, who provided him with the theoretical framework to fit many of the economic anomalies that he had identified, such as the endowment effect. From 1978 to 1995, he was a faculty member at the SC Johnson College of Business at Cornell University . After gathering some attention with a regular column in the respected Journal of Economic Perspectives (which ran between 1987 and 1990) and the publication of these columns by Princeton University Press (in 1992), Thaler was offered a position at the University of Chicago's Booth School of Business in 1995, where he has taught ever since. Thaler has written a number of books intended for a lay reader on the subject of behavioral economics, including Quasi-rational Economics and The Winner's Curse, the latter of which contains many of his Anomalies columns revised and adapted for a popular audience. One of his recurring themes is that market-based approaches are incomplete: he is quoted as saying, "conventional economics assumes that people are highly-rational—super-rational—and unemotional. They can calculate like a computer and have no self-control problems." Thaler is coauthor, with Cass Sunstein, of Nudge: Improving Decisions About Health, Wealth, and Happiness (Yale University Press, 2008). Nudge discusses how public and private organizations can help people make better choices in their daily lives. "People often make poor choices—and look back at them with bafflement!" Thaler and Sunstein write. "We do this because as human beings, we all are susceptible to a wide array of routine biases that can lead to an equally wide array of embarrassing blunders in education, personal finance, health care, mortgages and credit cards, happiness, and even the planet itself." Thaler and his co-author coined the term choice architect. In 2015 Thaler wrote Misbehaving: The Making of Behavioral Economics, a history of the development of behavioral economics, "part memoir, part attack on a breed of economist who dominated the academy—particularly, the Chicago School that dominated economic theory at the University of Chicago—for the much of the latter part of the 20th century." Thaler gained some attention in the field of mainstream economics for publishing a regular column in the Journal of Economic Perspectives from 1987 to 1990 titled Anomalies, in which he documented individual instances of economic behavior that seemed to violate traditional microeconomic theory. In a 2008 paper, Thaler and colleagues analyzed the choices of contestants appearing in the popular TV game show Deal or No Deal and found support for behavioralists' claims of path-dependent risk attitudes. He has also studied cooperation and bargaining in the UK game shows Golden Balls and Divided. As a columnist for The New York Times News Service, Thaler has begun a series of economic solutions for some of America's financial woes, beginning with "Selling parts of the radio spectrum could help pare US deficit," with references to Thomas Hazlett's ideas for reform of the U.S. Federal Communications Commission (FCC) and making television broadcast frequency available for improving wireless technology, reducing costs, and generating revenue for the US government. Thaler was the 2017 recipient of the Nobel Memorial Prize in Economics for "incorporat[ing] psychologically realistic assumptions into analyses of economic decision-making. By exploring the consequences of limited rationality, social preferences, and lack of self-control, he has shown how these human traits systematically affect individual decisions as well as market outcomes." Immediately following the announcement of the 2017 prize, Professor Peter Gärdenfors, Member of the Economic Sciences Prize Committee, said in an interview that Thaler had "made economics more human". After learning that he had won the Nobel Prize, Thaler said that his most important contribution to economics "was the recognition that economic agents are human, and that economic models have to incorporate that." In a nod to the sometimes-unreasonable behavior he has studied so extensively, he also joked that he intended to spend the prize money "as irrationally as possible." Paul Krugman, the 2008 winner of the Nobel Memorial Prize in Economics, tweeted "Yes! Behavorial econ is the best thing to happen to the field in generations, and Thaler showed the way." However, Thaler's selection was not met with universal acclaim; Robert Shiller (one of the 2013 laureates) noted that some economists still view Thaler's incorporation of a psychological perspective within an economics framework as a dubious proposition. And, an article in The Economist simultaneously praised Thaler and his fellow behavioral colleagues while bemoaning the practical difficulties that have resulted from causing "economists as a whole to back away a bit from grand theorising, and to focus more on empirical work and specific policy questions." In chronicling Thaler's path to Nobel laureate, John Cassidy notes that although Thaler's "nudge" theory may not overcome every shortcoming of traditional economics, it has at least grappled with them "in ways that have yielded important insights in areas ranging from finance to international development". Thaler also is the founder of an asset management firm, Fuller & Thaler Asset Management, which believes that investors will capitalize on cognitive biases such as the endowment effect, loss aversion and status quo bias. Since 1999, he has been the Principal of the said firm, which he co-founded in 1993. Russell Fuller, in charge of the firm's daily operations, said Thaler has changed the economics profession in that: "He doesn't write papers that are full of math. He writes papers that are full of common sense." Since 1991, Thaler is also the co-director of the National Bureau of Economic Research Behavioral Economics Project. Thaler was also involved in the establishment of the Behavioural Insights Team, originally part of the British Government's Cabinet Office but is now a limited company. Thaler made a cameo appearance as himself in the 2015 movie The Big Short, which was about the credit and housing bubble collapse that led to the 2008 global financial crisis. During one of the film's expository scenes he helped pop star Selena Gomez explain the 'hot hand fallacy,' in which people think that whatever is happening now will continue to happen into the future. ^ "American Economic Association". www.aeaweb.org. Retrieved 2017-11-05. ^ Appelbaum, Binyamin (October 9, 2017). "Nobel in Economics Is Awarded to Richard Thaler". The New York Times. Retrieved October 11, 2017. ^ Gauthier-Villars, David (October 9, 2017). "Nobel Prize in Economics Awarded to American Richard Thaler". The Wall Street Journal. Retrieved October 11, 2017. ^ Keyton, David; Heintz, Jim (October 9, 2017). "American Richard Thaler wins Nobel Prize in Economics". USA Today. Associated Press. Retrieved October 11, 2017. ^ Tetlow, Gemma (October 9, 2017). "Richard Thaler awarded 2017 Nobel prize in economics". Financial Times. Retrieved October 11, 2017. ^ Pollard, Niklas; Ringstrom, Anna (October 9, 2017). "We're all human: 'Nudge' theorist Thaler wins economics Nobel". Reuters. Retrieved October 11, 2017. ^ "Jewish American wins Nobel Prize in economics". The Jerusalem Post. ^ "Roslyn Thaler". geni com. ^ "Roslyn Melnikoff Thaler Obituary". Legacy. 1 October 2008. ^ "Alan Maurice Thaler". geni com. ^ "Masters Series Interview with Richard H. Thaler, PhD – IMCA – Commentaries – Advisor Perspectives". www.advisorperspectives.com. Retrieved October 11, 2017. ^ "Alan M. Thaler's Obituary on The Arizona Republic". The Arizona Republic. Retrieved October 11, 2017. ^ "Roslyn Melnikoff Thaler's Obituary on The Arizona Republic". The Arizona Republic. Retrieved October 11, 2017. ^ "About - france leclerc". france leclerc. Retrieved 2018-02-28. ^ Karp, Gregory (April 30, 2012). "Profile: Richard Thaler, University of Chicago Booth School of Business professor". Chicago Tribune. Retrieved October 11, 2017. ^ "Lumen". No. Spring 2016. Newark Academy. June 2, 2016. pp. 48–49. Retrieved October 11, 2017. ^ "Alumnus Richard H. Thaler earns Nobel Prize for work in behavioral economics". October 9, 2017. Retrieved October 11, 2017. ^ "Richard H. Thaler" (PDF). Booth School of Business CV. Retrieved October 11, 2017. ^ "Profile: Richard Thaler, University of Chicago Booth School of Business professor". tribunedigital-chicagotribune. Retrieved 2018-02-28. ^ "A 'playful' Nobel Prize winner laid groundwork for his field at Cornell | Cornell Chronicle". news.cornell.edu. Retrieved 2018-02-28. ^ Orrell, David (2012). Economyths: How the Science of Complex Systems is Transforming Economic Thought. Icon Books. p. 123. ISBN 978-1848312197. ^ Thaler, Richard H.; Sunstein, Cass R. (April 2, 2008). "Designing better choices". Los Angeles Times. Retrieved October 11, 2017. ^ Knee, Jonathon A. (May 5, 2015). "In "Misbehaving," an Economics Professor Isn't Afraid to Attack His Own". The New York Times. Retrieved October 11, 2017. ^ Thaler, Richard (1988). "The Winners Curse". Journal of Economic Perspectives. 2 (1): 191–202. CiteSeerX 10.1.1.404.8606. doi:10.1257/jep.2.1.191. ISSN 0895-3309. ^ Thaler, Richard (1988). "The Ultimatum Game". Journal of Economic Perspectives. 2 (4): 195–206. doi:10.1257/jep.2.4.195. ISSN 0895-3309. JSTOR 1942788. ^ Kahneman, Daniel; Knetsch, Jack; Thaler, Richard (1991). "The Endowment Effect, Loss Aversion, and Status Quo Bias". Journal of Economic Perspectives. 5 (1): 193–206. doi:10.1257/jep.5.1.193. ISSN 0895-3309. ^ Post, Thierry; van den Assem, Martijn J.; Baltussen, Guido; Thaler, Richard H. (March 2008). "Deal or No Deal? Decision Making under Risk in a Large-Payoff Game Show". American Economic Review. 98 (1): 38–71. doi:10.1257/aer.98.1.38. ISSN 0002-8282. SSRN 636508. ^ van den Assem, Martijn J.; van Dolder, Dennie; Thaler, Richard H. (January 2012). "Split or Steal? Cooperative Behavior When the Stakes Are Large" (PDF). Management Science. 58 (1): 2–20. doi:10.1287/mnsc.1110.1413. ISSN 0025-1909. SSRN 1592456. ^ van Dolder, Dennie; van den Assem, Martijn J.; Camerer, Colin; Thaler, Richard H. (May 2015). "Standing United or Falling Divided? High Stakes Bargaining in a TV Game Show". American Economic Review. 105 (5): 402–407. doi:10.1257/aer.p20151017. ISSN 0002-8282. SSRN 2344422. ^ Thayer, Richard (February 28, 2010). "Selling parts of the radio spectrum could help pare US deficit". Taipei Times. Retrieved October 11, 2017. ^ "The Prize in Economic Sciences 2017" (Press release). Royal Swedish Academy of Sciences. October 9, 2017. ^ "The Prize in Economic Sciences 2017 - Prize Announcement". www.nobelprize.org. Retrieved 2018-02-28. ^ Isaac, Anna (October 9, 2017). "'Nudge' guru Richard Thaler wins the Nobel prize for economics". The Daily Telegraph. Retrieved October 11, 2017. ^ Partington, Richard (October 9, 2017). "Nobel prize in economics awarded to Richard Thaler: Pioneer of behavioural economics is best known for 'nudge' theory, which has influenced politicians and policymakers". The Guardian. London. ^ Long, Heather (October 9, 2017). "American professor wins Nobel Prize in economics for trying to understand bad human behavior". The Washington Post. Retrieved October 12, 2017. ^ Shiller, Robert (October 11, 2017). "Richard Thaler is a controversial Nobel prize winner – but a deserving one". The Guardian. London. ^ "Richard Thaler's work demonstrates why economics is hard: It is difficult to model the behaviour of creatures as irrepressibly social as humans". The Economist. October 11, 2017. ^ Cassidy, John (2017-10-10). "The Making of Richard Thaler's Economics Nobel". The New Yorker. ISSN 0028-792X. Retrieved 2018-02-28. ^ "Behavioral Investing". Fuller & Thaler Asset Management. Retrieved October 11, 2017. ^ "About Us". Fuller & Thaler Asset Management. Retrieved October 11, 2017. ^ "Fuller & Thaler Asset Management, Inc. | The Behavioral Edge ®". Fuller & Thaler Asset Management, Inc. | The Behavioral Edge ®. Retrieved 2018-02-28. ^ "Richard H. Thaler". www.nber.org. Retrieved 2018-02-28. ^ Halpern, David (10 October 2017). "'Behavioural economics' may sound dry – but it can change your life". www.theguardian.com. Guardian News and Media Limited. Retrieved 11 October 2017. Thaler was instrumental in the creation of the UK’s Behavioural Insights Team (BIT), originally a No 10 unit, back in 2010. ^ Watercutter, Angela (December 11, 2015). "The Big Short Somehow Makes Subprime Mortgages Entertaining". Wired.com. Retrieved October 10, 2017. ^ Richard Thaler, Selena Gomez (2015). The Big Short movie - explanation of the "hot hand fallacy" (film scene via YouTube). Paramount Pictures, Plan B Entertainment. This page was last edited on 3 April 2019, at 16:38 (UTC).